One day while sitting in the dr’s office waiting for my son to be seen I was looking at video’s on gardening in Florida. I came across a video by Growing Your Greens on Youtube. 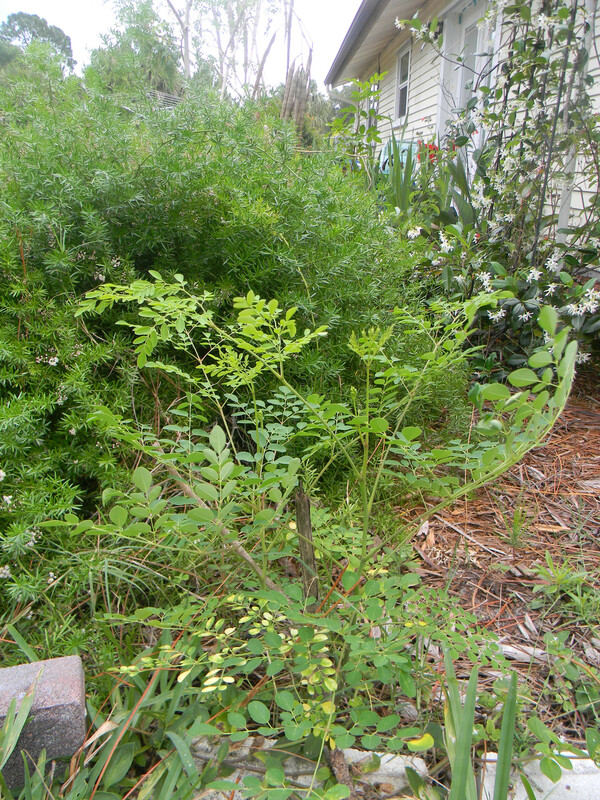 The Moringa trees that he showed peaked my interest and I began to do more research on the web. I found that this really is an amazing tree. You can eat almost every part of the tree leaves, flowers, seeds and pods. You can also use the sap for wounds and the seeds will purify water. These are some videos that I found explaining how the Moringa is being used around the world and the benefits of Moringa. After watching these videos I decided to purchase some seeds and try to grow my own Moringa. 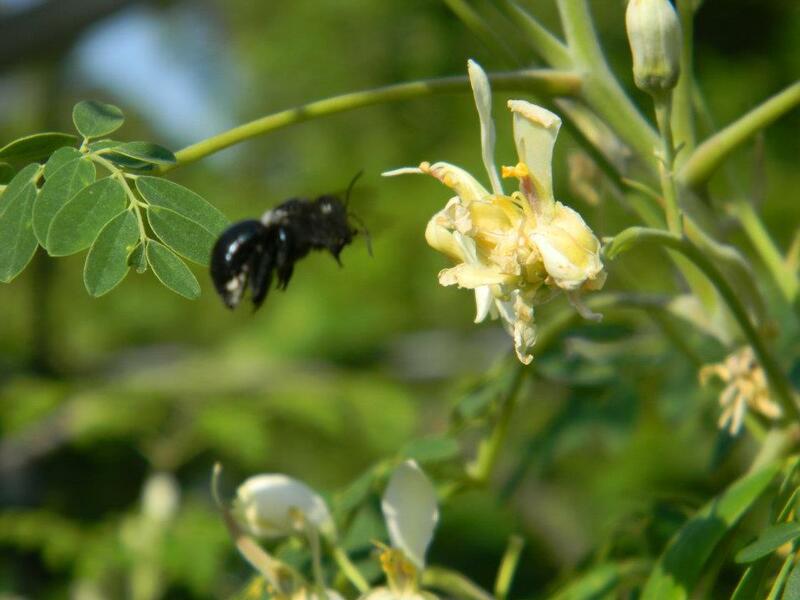 This is the website where I ordered my seeds: I Love Moringa. They were very friendly and shipped my seeds quickly. They even shipped additional seeds in case the ones I had did not sprout. I ordered the variety oleifera. There are several different varieties you can order and you can even order seedlings. Before planting I read several websites that said you should soak your seeds or break the outer shell. I did experiments using these various methods but found that I had no higher yield than when just planting the seed (video of seeds). I planted my seeds in May of 2011 in peat pots and then transplanted them directly into the ground. Here is one after less than 2 months. And here they are today. You want to keep your Moringa pinched back so that it will produce more leaves and you can reach the top of the tree. I have had a few pods ripen with seeds and here two of my second generation trees. It takes quite a while for the pods to mature. The pod begin to dry from the bottom up and you must wait until the whole pod has dried to collect the seeds. Moringa flowers and a small pod on the top right flower. 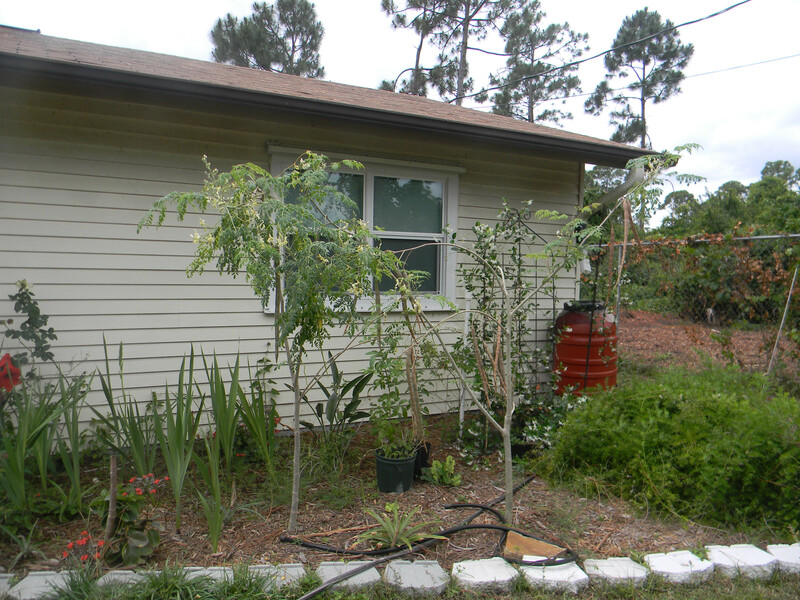 I had 4 trees growing but one was a little homely so I cut it back. They are supposed to reproduce after cutting back but this one is taking a while. This one died back because of a freeze we had last winter but is coming back. I eat the leaves often and just pull them off the tree. This tree is also known as the horseradish tree as the leaves have a spicy taste to them. The younger the leaves the spicier they are. I have also put these leaves in salads and cooked dishes such as lasagna. They are not spicy after being cooked. The flowers make a wonderfully mild tea. I just steeped them in hot water. The smaller pods can be cooked like green beans or just eaten right off the tree. 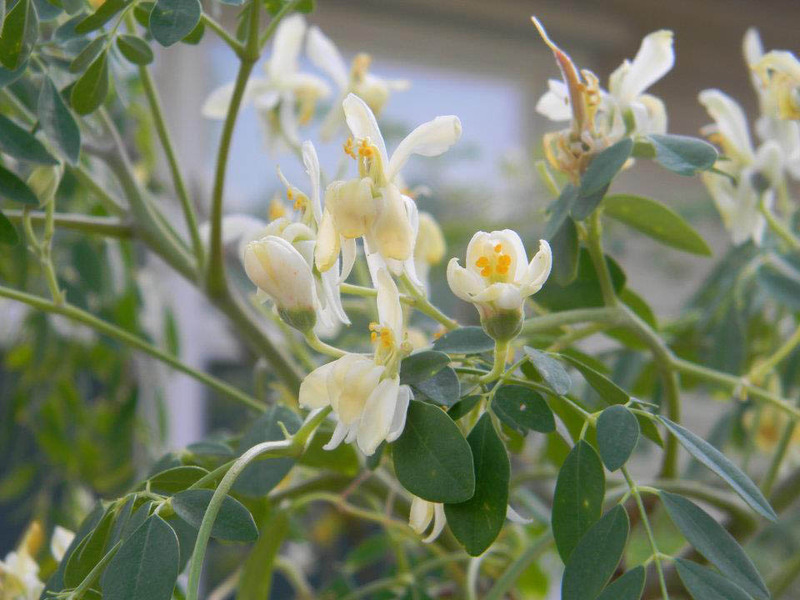 If you live in a climate that will grow Moringa I would highly suggest you try this tree. 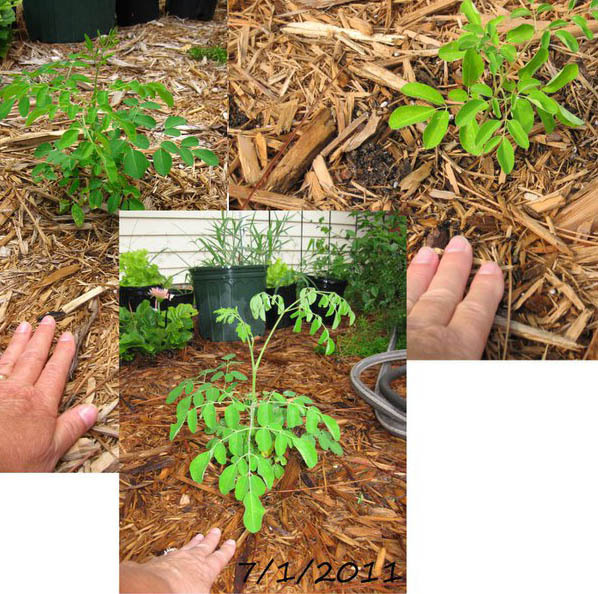 This entry was posted in Gardening and tagged gardening, Moringa. Bookmark the permalink. My cousin sent me the link to your blog. I’m in FL also. I ordered from the same place you did and out of however many seeds I got, only one ultimately survived. It’s growing very slowly in a pot. Maybe it should be put into the ground instead??? I’ll have to order more seeds and see if we can get more to live because I want to use them for food. Oh, and my one plant seems to take offense when I pick some leaves off or water it. What a plant this one is. Will order more though. Got got almost 100% growth on the seeds I had. I planted them in peat pots and then put those right into the ground. I have not grown them in pots. I also had 7 2nd generation plants. I planted 4 myself and they are doing great. What area of Florida are you in. I am on the central east coast.